Memories of holiday celebrations remain very food centric for me. When I recall the roasts, turkeys and hams of holidays past, I am instantly transported to the chaos and love of the kitchens where those meals were affectionately prepared. Christmas was always spent at my aunt and uncle’s home. My brother and I could never wait to arrive there to play with our cousins, see all the new toys Santa delivered and for me, eat copious amounts of my aunt’s stuffed mushrooms. These mushrooms somehow verified it was finally Christmas. They were not fancy, just mushrooms with a piece of link sausage placed in the cap and baked to perfection. I craved these mushrooms all year. They would disappear within minutes of exiting the oven. As we grew older the family increased and now boyfriends, girlfriends, new husbands and wives were also attending the holiday celebrations so the mushrooms would vanish at an even faster rate. There were never enough of these little bites to meet the growing families’ demands and the competition to score a few was fierce. I truly miss that. 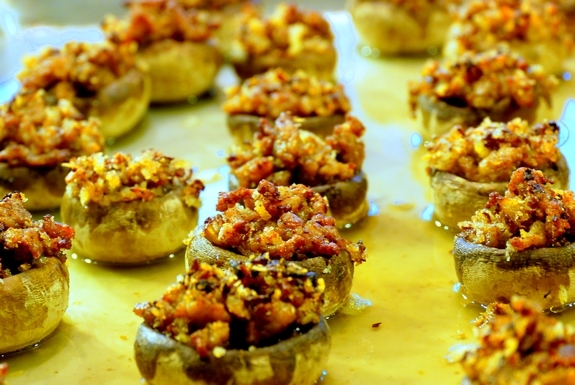 The memories of those mushrooms over the years brought my own creation of Holiday Sweet Stuffed Mushrooms. While they are very different from my aunt’s version, they still evoke great memories of the holidays in my youth. During the hustle and bustle this time of year, it’s important to have appetizers we can prepare ahead and have ready to place in the oven. These mushrooms can be made to a certain point earlier in the day and placed in the oven right before guests arrive. Here’s what you will need: Mushrooms, ground pork, fennel seed, ground cinnamon, ground nutmeg, onion, orange zest, chicken broth and bread crumbs. Ingredients not shown: Garlic, olive oil, salt and pepper. Remove the stems from the mushrooms and chop; reserve the caps. Heat 2 tablespoons of the oil in a large sauté pan. Add ½ cup chopped onion and cook until softened; about 5 minutes. Add the chopped stems and cook over high heat until they begin to dry; about 5 minutes. 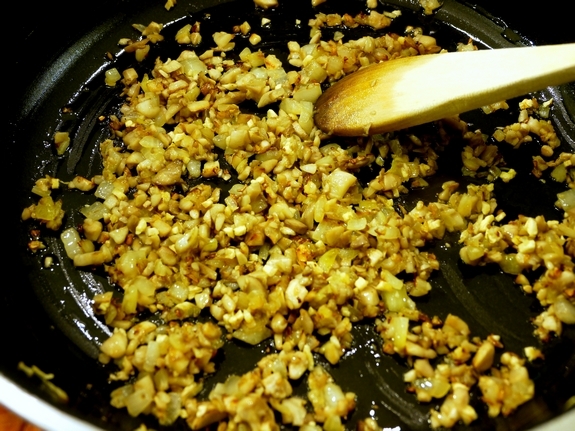 Stir in 1 tablespoon of minced garlic and cook until fragrant; about 30 seconds. Transfer mixture to a bowl and set aside. Heat the remaining 2 tablespoons of oil in the same pan. Cook the pork, breaking it up with a spoon, until cooked through. Stir in ½ teaspoon cinnamon, ¼ teaspoon nutmeg, 1 teaspoon of toasted, ground fennel seed and 1 tablespoon of grated orange zest. Add the cooked mushroom and onion mixture and ¼ cup bread crumbs; mix well. Season to your own taste with salt and pepper. Preheat oven to 350 degrees. Stuff the pork mixture into the mushroom caps. Place the mushrooms in a baking pan and drizzle 1 cup of chicken broth around them. Bake until they are cooked through; about 20 minutes. Place them on a platter and drizzle with the broth from the pan, serve warm. Remove the stems from the mushrooms and chop; reserve the caps. Heat 2 tablespoons of the oil in a large sauté pan. Add onion and cook until softened; about 5 minutes. Add the chopped stems and cook over high heat until they begin to dry; about 5 minutes. Stir in garlic and cook until fragrant; about 30 seconds. Transfer mixture to a bowl and set aside. Heat the remaining 2 tablespoons of oil in the same pan. Cook the pork, breaking it up with a spoon, until cooked through. Stir in cinnamon, nutmeg, fennel seed and orange zest. Add the cooked mushroom and onion mixture and bread crumbs; mix well. Season to your own taste with salt and pepper. Preheat oven to 350 degrees. Stuff the pork mixture into the mushroom caps. Place the mushrooms in a baking pan and drizzle chicken broth around them. Bake until they are cooked through; about 20 minutes. *Toast whole fennel seeds in a frying pan over moderate heat until fragrant; about 1-2 minutes. Let them cool slightly and place in an electric spice mill or a clean coffee grinder to pulverize, or crush them with a mortar and pestle. My wife did a large tray of those for Thanksgiving, along with several dips, spreads, a cheese tray, two pates and a whole dry cured ham. I got one mushroom, when I went back for a second they were gone. I would love your recipes in a more printer friendly format! 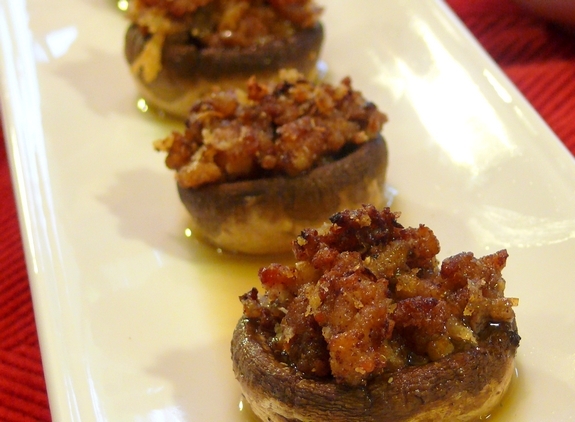 stuffed mushrooms are one of my favorite appetizers… these look fabulous! Those mushrooms look yummy. I can’t wait to try them. Yours look so perfect, I can just imagine the cinnamon and nutmeg flavor! Do you use the printing icon? Wish I wasn’t such a lazy cook, as these look DELICIOUS! 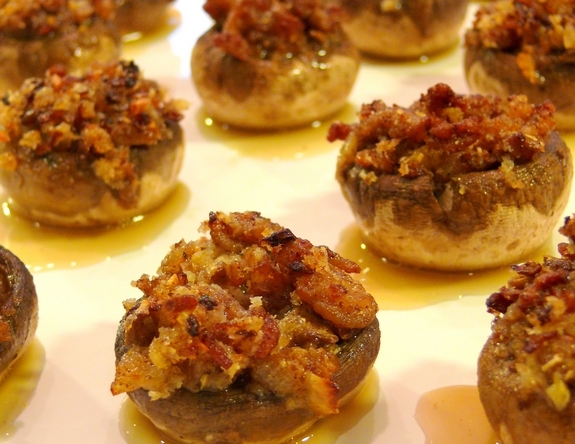 I like this adaptation of stuffed mushrooms. Sound and look delicious. This is my kind of finger food – hearty, complex and delicious! We ate some pretty dismal cheese and crackers as appetizers this year as I didn’t have a moment to make anything ahead (blaming it all squarely on the narrow shoulders of our 6 week old baby), so looking at this makes me sad. Well, jealous, and hungry! 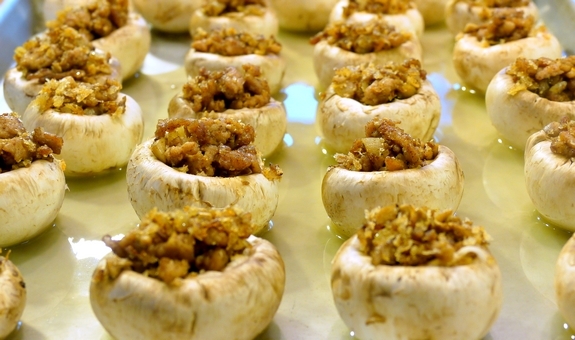 Have you ever tried it with portebella mushrooms? 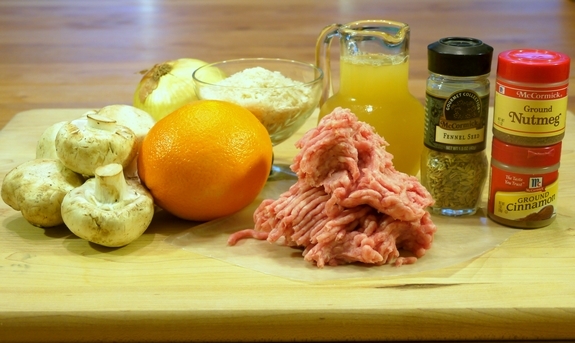 I think I’m going to try it both types of mush and ground turkey and the pork…maybe even intergrate the 2 meats.